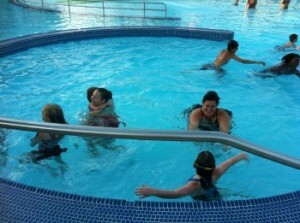 I took my crazy crew to the new Urbana Outdoor Aquatic Center on Memorial Day. Because I’m a little spontaneous about things like that and we all love swimming, I didn’t really plan this in advance. I just made sure we were all actually wearing swim attire and sunblock and we headed out the door. In retrospect, for the very first pool event of the summer, I should have spent a few minutes thinking my trip through a bit more. Thankfully, the new Urbana facility is fabulous enough to make up for my lapses in judgment – I didn’t bring enough food, we were short one towel and I forget to bring a book to read for myself. I’ll start this with the disclaimer that my children, ages 6, 9 and 13, need no supervision in the water other than that of a lifeguard. They have all passed and completed the swim lesson program at the UIAC and swimming is one of our top family activities – we spend a lot of time in the water and as family activities go it’s one that we can all enjoy without any adaptation or accommodation for age, ability or skill level. So I let them roam on their own after we oriented ourselves. And as an old-school Sholem lifeguard from the days of yore, back before rescue tubes were even invented – I have some rather high standards. This was our first visit to the new Urbana facility so I was all about making sure the kids knew where the locker rooms were, how to find a manager if they needed help, etc. It was much easier than I expected to get that done – because of the main set of stairs that lead down to the pool itself from the bathhouses and main offices, they have an information and first aid station right down on the deck and very easy to find. We picked out what we call our “base camp” in the grass since it was a fairly busy day and most of the deck space and lounge chairs were already taken and I turned the kids loose. They were a little unsure of where to go at first – the separate pools for different activities are really neat but it took a few minutes to figure out how to get from point A to B to C – so we started with the slides, which are nothing short of awesome. You have to be 48” tall to ride regardless of swimming ability and nobody can catch a child at the end – fortunately my youngest little fish is now tall enough to ride all the slides in East Central Illinois so he was one very happy swimmer. All three of them tried their skill on the climbing wall – that things is very cool – and then the younger two settled in for a long hour at the splash river area. The separation of pools and consequently filtration systems came in very handy when the splash pool with the tree house play area and kiddie pool was closed for about 45 minutes due to a chemical imbalance. The diving well/climbing wall pool remained open as did the larger open pool with lap lanes and a six foot deep end area for general chaos and mayhem. It’s early in the season – we were there on day three of the year – so I was impressed with the professionalism of the lifeguards and management staff at this early juncture. We loved being able to bring in our own food and eat whenever we wanted. A lot of variety in activities, even a sandbox area near the kiddie pool, kept my younger two busy for a very long time. From the mom perspective, the abundance of shade around the pool deck, variety of activities and ease of access to first aid made this a winning afternoon trip. From the 13-year-old, the key was the diving board, climbing wall and the drop-off slide, all three of which exit into the deepest pool in the facility. 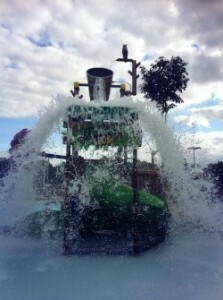 The younger two were most impressed with the splash river and water slides. I’ve been bombarded with “Mom, when are going back to URBAAANA” since the minute we got back. Crystal Lake Park Family Aquatic Center: 1401 N. Broadway, Urbana, IL. (217) 239-SWIM (7946). 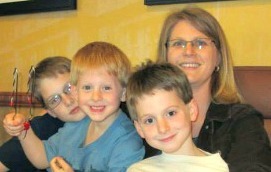 Bethany Parker is a single mom to three boys that are growing up so fast it is hard to keep up.